Readers have a lot of questions about these popular models, wondering how they are different. If you search the internet looking for the facts the information can be confusing, which is exactly why we set out to explain their differences. We even contacted Husqvarna to ensure we got our facts straight. All of these chainsaws share common features but there are differences you need to be aware of. All of these Husqvarna 450 models are well-rounded and designed for a range of cutting tasks for homeowners, landscapers and ranchers (thus the name “rancher”). All of them are ideal for a landowner who considers himself to be a part-time chainsaw user. They are powerful enough for all felling, bucking and clearing on the ranch or large wooded real estate. They are all lightweight, efficient and easy to start and maneuver. They all have X-TORQ engines, offering good fuel consumption and lower emission levels. Husqvarna equipped all models with some Easy Start features and an auto return stop switch that makes starting a lot easier. The Husqvarna 450 series chainsaws have similar-sized engines and mostly share the same features. The 460 Rancher and the 465 Rancher have bigger engines and longer bars. As a result, the chainsaws have an upgraded bar lubricating system. The Husqvarna 450 and the Husqvarna 450e are the only non-Rancher models in our lineup. It seems fair to compare them first, but they share the same engine, body, oil system and capabilities with the 450 Rancher. Difference between the Husqvarna 450 models? “…The 450 Rancher had a stop switch that returns to the default start position once you turn the saw off, for easier starting. The 450 features a combined choke and stop switch that won’t correct a mistake, but will help rookie users not flood the engine out so often. You will notice that the Husqvarna model numbers include the approximate engine size in cubic centimeters. The 450 has a 50cc engine, 60cc for the 460, and 55.5c on the 455. You may therefore expect 65cc on the 465, but it’s a 64.1cc, close enough. Soft inlay, ergonomic trigger and asymmetrical handle. You will find the same engine and fixed volume bar lubrication on the 450-chainsaw series. On the 450 and 450 Rancher the governor limits its maximum speed to 9000 rpm. On the Husqvarna comparison chart they list the 450e maximum speed as 9600 rpm, but on other Husqvarna sites it’s 9000rpm. They use the same engines; therefore, I suspect that the limit is 9000rpm. All three use the same spur sprocket with 7 teeth, therefore the chain speed of the 450 models are all 75.8 ft/sec. These chainsaws all utilize Husqvarna X-Torq engines, famous for its durability, power and low fuel consumption. The crankshaft is a three-piece design, with roller bearings providing greater reliability and reduced internal wear. This is one of the main reasons for the lower fuel consumption and long engine life. The 50cc two-stroke X-Torq engines revs up easily to the 9000-rpm mark, providing ample torque (2.6 Nm) that makes cutting all kinds of wood a pleasure. You may notice that Husqvarna list some models as Easy to start and others as Smart start. The Easy to start feature is a start/stop switch, Smart Start and Air purge bulb (fuel pump) used together. The Smart Start feature is available on the 450, 450 Rancher and 450e. This reduces the effort required to start the engine. To start a cold engine, you prime the air purge bulb (also called the fuel pump) until you can see fuel in it. Then you activate the choke and engage the chain brake by pushing the handle forward. Before you pull the handle of the cord to start the engine, you press the de-compression valve. This reduces the effort to pull the cord by up to 40%. When the engine fires the first time, you release the choke. Then press the de-compression valve once more and pull on the cord. The engine will start with one or two pulls. Sometimes called the fuel pump it’s the same thing as the air purge bulb. Before you start the engine from cold, you press it up to six times to make sure there is fuel in the carburetor. When ready, fuel is visible in the bulb, it removes air from the carburetor and fuel system for quick starting. The combined choke and stop control handle is available on the 450 and 450e. Husqvarna combined the controls for the stop switch and the choke. When you pull the choke control out, it sets the stop switch to the start position. To stop the engine, you press down on the stop switch. The 450 Rancher has separate controls for the choke and the stop switch. After using the stop switch to kill the engine, it automatically resets to the ON position, enabling the engine to start again. This way, you won’t forget to set it to “run” mode before you start the engine. All Husqvarna chainsaws rely on metal springs in the engine suspension to reduce vibrations felt by the operator. Chainsaw vibrations are a major cause of fatigue for the person handling it and all manufacturers use a vibration damper to lessen vibrations. The Husqvarna system is one of the best. Another Husqvarna feature that reduces fatigue and gives the user better grip is the 7° offset of the front handle, and front hand guard. The Rancher models feature a better ergonomic handle that reduces fatigue when cutting many trees at one time. Whereas the 450 and 450e handles are fit for a homeowner with less cutting at one time. Husqvarna use a new flip-up tank cap on the 450 Rancher and the 450e. This makes life simpler when refueling the chainsaw, providing adequate grip to open the filler even with a vacuum in the tank. You will not need to remove a glove to do this. They designed the cap to allow air in and replace the vacuum after turning it through 1/4 turn and break the suction power. The fuel level in the fuel tank is visible in the 450 range, enabling you to estimate how much fuel remains. Husqvarna tuned the oiler system to the fuel supply so that both empty simultaneously. This makes it easier to remember to top up both during a refuel. Which Husqvarna Chainsaw Model is Right for You? 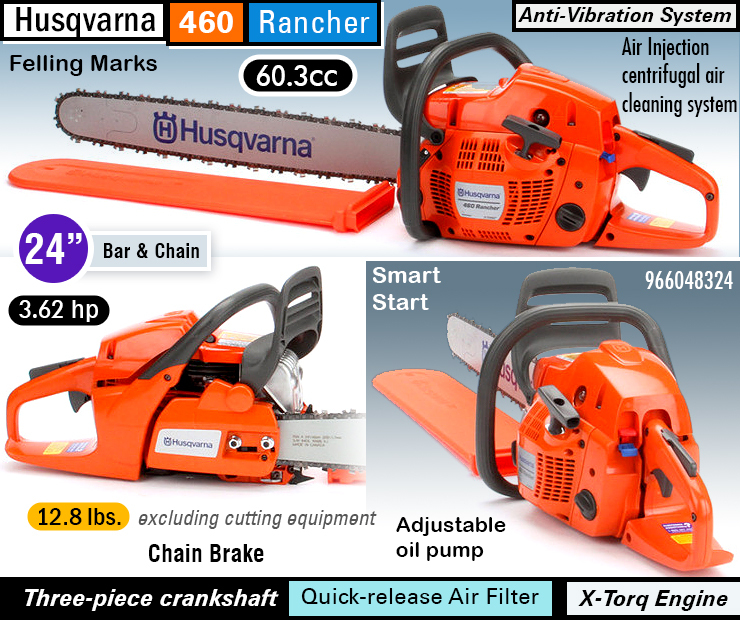 All these chainsaws have the Husqvarna Air Injection feature to keep the engine clean and lower engine temperatures. It is a centrifugal pre-filter mounted to the flywheel which forces air into the machine. Centrifugal forces speed up the larger particles in the air, forcing them to the outside of the air path and away from the flywheel. Closer to the edge of the flywheel, the airstream is cleaner and an air scoop funnels the cleaner air toward the air filter. The flywheel cannot speed up the smallest dust particles sufficiently to throw them out of the airstream, resulting in some dust traveling to the air intake. Therefore, Husqvarna still relies on the air filter to remove fine debris. It funnels the bulk of the dirt away and out the machine. In all conditions, the Husqvarna system keeps the air filters cleaner for longer, ensuring better consumption and maximum power. All Husqvarna chainsaws have felling marks on the body for lining up the bar to the cut. You line up the felling lines with the mark where you want the tree to fall and you do the top cut first. It’s accurate if done properly. The main difference between the 450e and the other two 450’s is its chain tensioning system that requires no tools. The tool-less adjuster is convenient. If the chain needs tightening up, you can do it immediately, without the need to fetch a tool. Because of this, it’s more likely that you will tension the chain frequently, extending bar and chain life. During a violent kickback, the inertia chain brake will activate even if the top handle chain brake does not reach your hand. It’s an additional safety feature that aims to eliminate injuries from kickbacks. I’m throwing the Husqvarna 455 Rancher into the mix because it offers a Rancher model with a bigger, 55.5cc engine, delivering 3.49 horsepower. In comparison to the 450 Rancher with its 50cc engine, delivering 3.2 horsepower. The bigger engine not only delivers more horsepower. At 3.4 Nm torque, it is considerably higher than the 2.6 Nm of the smaller engine. Both chainsaws come with spur type, 7-tooth sprockets and have the same maximum engine speed. The 455 Rancher is therefore more powerful, and provides more torque than the 450 Rancher. I would choose the 455 Rancher if I needed a chainsaw that fits the gap between a 450 and the 460 Rancher. Dealers sell the Husqvarna 455 Rancher with an 18-Inch bar and chain, but recommended bar lengths range from 13 to 20-inches. It says “Farm tough” on the bar, and it is. The 455 can cut through an 18 inch log in under a minute without getting bogged down, which is impressive. What the 460 Rancher and 465 Rancher offer over the 450 Rancher? The 460 Rancher and 465 Rancher also belong to the all-rounder range of Husqvarna chainsaws. They share most features with the 450 Rancher. The obvious differences are the bigger engines, which are powerful enough to drive longer chains. With the longer bars comes the adjustable oil delivery to lubricate these long chains. The 460 and 465 Ranchers have adjustable lubrication-oil pumps. The oil pumps can deliver more oil to supply adequate lubricant to longer bars. The improved oil feed is adjustable to suit the bar length and the fitted chain. If adjusted correctly, you will save on oil and reduce pollution. The adjustment has three positions. The recommended settings on the 460/465 Rancher is position 1 for a 15-inch bar. For a 16 to 18-inch bar, the setting is position2, with position 3 for a 20 to 24-inch bar. To save even more, oil delivery stops when the engine is idling and the chain stationary. How do you determine when the chainsaw is delivering just enough oil and will not damage the chain and bar? The old trick is to point the chainsaw to a light surface and pull the trigger to run the chain. It should throw some oil off the end, but not too much. Then you inspect the underside of the bar to make sure the oil lubricates the most critical friction areas. The chain can fling off too much oil and waste it. Use the correct oil as recommended by Husqvarna, it is sticky enough to reach and lubricate the underside. The shortest bar you can use with the 460 Rancher and 465 Rancher models is 15 inches. The maximum bar length recommended for the 460 Rancher is 24 inches and the 465 Rancher 28 inches. By comparison, the longest bar you can fit to a 450 series is 20 inches. The 450 Rancher chain adjuster screw is next to the bar. The 460/465 Ranchers have an improved side mounted chain tensioner. It makes tensioning the chain a simpler and more accurate task, which I prefer over the adjuster of the 450. The 460 and 465 Rancher chainsaws are at the top end of the all-round series of chainsaws. The 460 Rancher uses a 60.3cc X-Torq engine, with 3.62 horsepower at the maximum 9000 rpm. By comparison, the 450 Rancher, with its 50cc engine delivers 3.2 horsepower. The biggest difference is the jump in torque from 2.6 Nm to 3.4 Nm. Both chainsaws come with spur type, 7-tooth sprockets and has the same maximum engine speed. The 465 Rancher engine delivers 4.29 horsepower at 9600 rpm and its torque is surprisingly low at 3.49 Nm. The chain speed is 70.21 ft/sec. using a rim-type sprocket with 7 teeth. Another feature on the 465 Rancher chainsaw is the AutoTune carburetor. This Husqvarna developed carburetor, actively controls the butterfly valve and the fuel supply with a microcomputer. It monitors the environment and engine conditions in real time. This information is used to control combustion variables, varying the amount of air entering the cylinder with the butterfly. The system is effective and supplies more torque over a wider range of engine speeds. Because it can adjust to dirty air filters, which clog the airflow, the chainsaw can run with a badly clogged air filter. The 465 Rancher is more effective in dusty environments. The 460 and 465 Rancher models have the Combined choke/stop control levers used on the 450 but not the 450 Rancher. It uses the simpler Auto return stop switch assembly. Husqvarna do not use the Flip-up tank cap of the 450 Rancher on the 460 and 465 Ranchers. It’s a pity this is not common to all of them, although the regular tank caps are effective and seal well. The flip-up cap is easier to remove. Another 450 Rancher not shared on the 460 and 465 Ranchers is the visible fuel level window and the 450 Rancher’s enhanced rear handle. It surprised me that the 460 Rancher does not have a convenient Snap-lock cylinder cover. You need a screwdriver to remove the cylinder cover when doing maintenance. Which Husqvarna Rancher model is right for you? A chainsaw with these capabilities should satisfy most buyers. It really depends on your needs and how skilled you are. Husqvarna perfectly balance these chainsaws with the recommended bar sizes and none of them will disappoint you. Should any of the 450 models be available at a reasonable price, it is a good buy. You need not feel that the 460 Rancher is a more robust chainsaw. It’s more powerful and can take longer bars for bigger jobs. The tool-free chain adjuster of 450e-series can be the more attractive option for some. There is no difference in its capabilities, compared to the rest of the 450 range of chainsaws. The only real difference is the chain adjuster. Should you have a lot of large trees on your property to fell, or if you depend on bucking firewood from big stumps, then the 460, or the 465, Rancher chainsaw models may be more suitable for your needs.